View More In Hand Puppets. 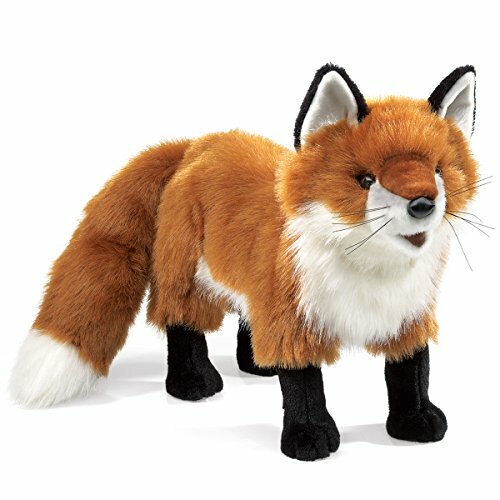 A sly little trickster that's been featured in folklore from Europe, North America, and Japan, the Folkmanis Red Fox hand puppet looks good in its standing position. This vulpine charmer will brighten your day, and is recommended for ages 3 and up. Ideal for use in interactive stage and puppet theater, Folkmanis Puppets are also great for teaching, daycare, school, pretend play, games and parties, or to pair with a book for storytelling. Easy to feed and care for, just add lots of love and snuggly fun. This puppet measures 20 x 5 x 11 inches (LxWxH). Folkmanis has been encouraging young imaginations to blossom since 1976 with its innovative and engaging specialty puppets, promoting creativity and discovery while winning nearly every industry, child development, and kid-tested award. Folkmanis has grown to become the premier manufacturer of plush puppets worldwide, offering over 200 of the most heartwarming and realistically designed creatures--both exotic and familiar--on the market today. (Birthday: July, 2010).